Most LIKE : 1 x hamper worth of RM180 and GoodMorning voucher worth of RM100. Most CREATIVE : 10 x hamper worth of RM100 and GoodMorning voucher worth of RM50. 1 participant with the most like & 10 participants with the most creative photo will be selected as the winners. Step 1️⃣️ : Like & follow GoodMorning 18 Grains Facebook Page & Instagram. Step 2️⃣️ : Take the most HANGAT photo of cheering for the favourite team! 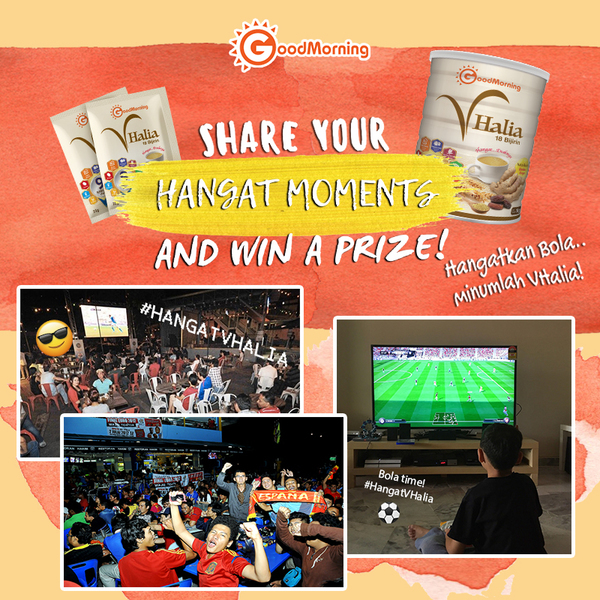 Step 3️⃣️ : Upload your HANGAT photo in the comment section with hashtag #HangatVHalia. Then, PM Good morning about your personal details (Full Name, Email, Mobile Number).